Universally used in the steel industries, the Ferro Titanium Alloy manufactured by us is used as an additive in the production of optimum quality steel. Ferro Titanium alloy is also preferred in the aviation industry as a raw material. 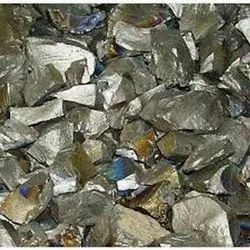 Ferro titanium alloy is a ferro alloy, an alloy of iron and titanium with between 10-20..45-75 % titanium and sometimes a small amount of carbon. 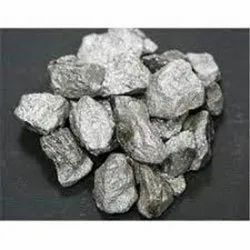 It is used in steelmaking as a cleansing agent for iron and steel; the titanium is highly reactive with sulfur, carbon, oxygen, and nitrogen, forming insoluble compounds and sequestering them in slag, and is therefore used for deoxidizing, and sometimes for desulfurization and denitrification. In steelmaking the addition of titanium yields metal with finer grain structure. Ferrotitanium powder can be also used as a fuel in some pyrotechnic compositions. Ferro titanium alloy can be manufactured by mixing titanium sponge and scrap with iron and melting them together in an induction furnace. Ferro niobium alloy is an important iron niobium alloy, with an niobium content of 60-70% It is the main source for niobium alloying of HSLA steel and covers more than 80% of the world wide niobium production. The niobium is mined from pyrochlore deposits and is subsequently transformed into the niobium pentoxide Nb2O5. This oxide is mixed with iron oxide and aluminium and is reduced in the an aluminothermic reaction to niobium and iron. The ferro niobium alloy can be purified by electron beam melting or used as it is. For alloying with steel the ferro niobium is added to molten steel before casting. Looking for Ferro Titanium / Ferro Niobium ?